Regular readers will be aware I do a little coffee roasting at home, the majority of which occurs with green coffee beans bought online. 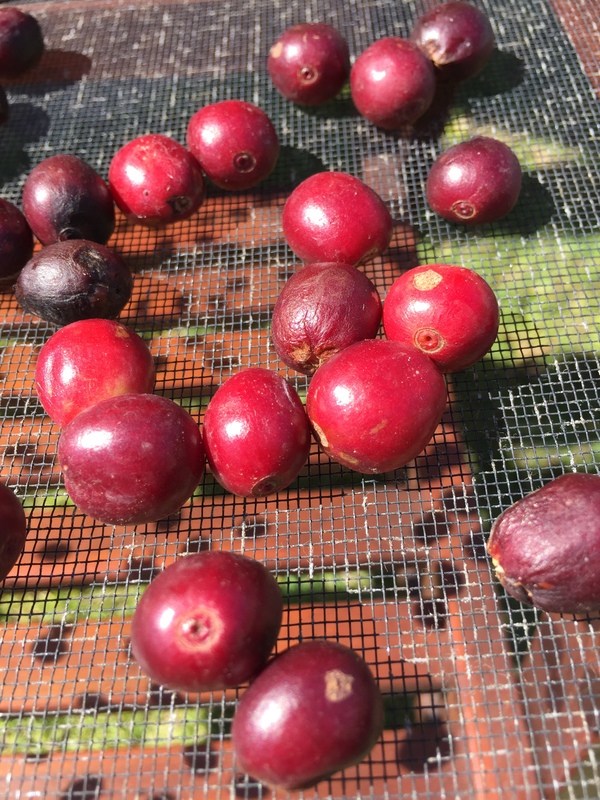 A couple of years ago I published a five-part series on the techniques involved with washed processing of coffee, taking a very small batch through the processing stages from cherry off the tree and into the cup. Back in November last year I republished these in a single post, in the knowledge I would be running through a similar experiment using natural processing methods. Around the same time I also put together a short piece about the app Day One, and how I planned to use it to monitor my progress. One of my main aims in writing here is to push myself along in learning a little more about the specific details of my interests — in this case, coffee processing. To that end, it will help to look at some background information before I get started. Coffee processing — what are the options? Although the following is not a detailed explanation of each, it should serve as a general indication of the differences between the various processing options available after coffee is harvested from the tree. The three more popular methods at the current time are natural (dry), washed (wet) and honey processing. I will also briefly describe the semi-washed or wet-hulled method, and a semi-dry method: pulped natural processing. Cafe Britt – Honey Processed Coffee: What makes it so special? Seattle Coffeeworks – What on Earth is Honey Process? 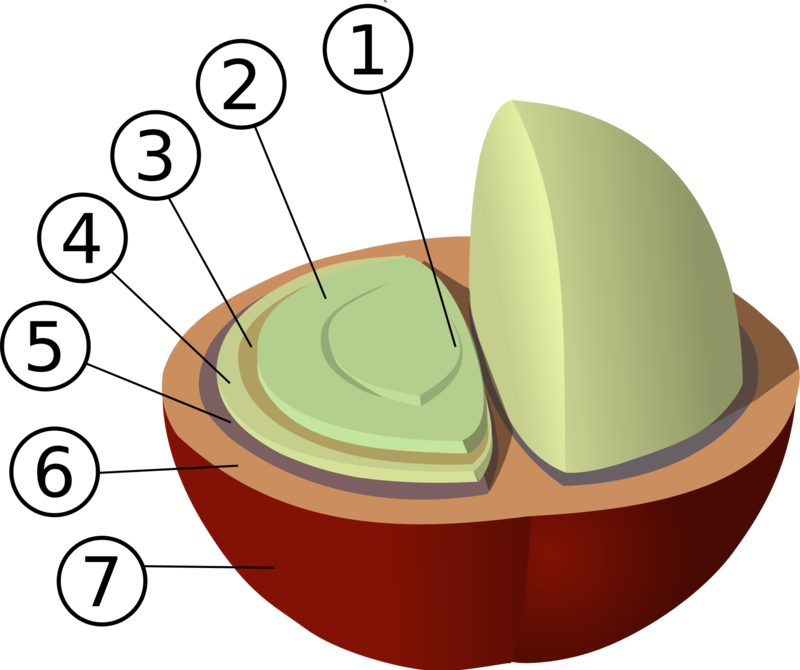 The article on the Seattle Coffeeworks blog is particularly useful to view the “anatomy” of a coffee bean, and provides a little more detail in describing each of the layers, which might be helpful in gaining a better understanding of some of the terms described below. Drying is then undertaken on patios or raised drying beds. Further drying occurs in the sun by day, with the coffee stored in bags overnight to continue the fermentation until the moisture content is reduced to the desired level. An interesting point to note here is a point about wet-hulled green coffee being recognisable by its “dark-green and patchy colour” which may also be described as blue. I’ve certainly noticed this in the green coffee I have purchased which was processed in Sumatra, and it is very bluish in colour — quite noticeable compared with green coffee from other regions around the world. I’d highly recommend reading the original article on Perfect Daily Grind, as it goes into considerable detail around the origins of why the processing is used, possible defects, and advice for getting the most out of these types of coffees (including roasting). Although not typically a category you often see listed individually, semi-dry processing does use significantly less water than the washed or semi-washed methods described above. Pulped natural processing is apparently a common method used in, but not unique to Brazil — and you will certainly see this description on coffee originating from other countries. The actual stages are similar to the washed process described above, however the mucilage is removed with a pressure washing apparatus (taking care of steps 2 and 3 above), which removes the need for fermentation. Without requiring large tanks and significant water for fermentation, the pulped natural method doesn’t quite fit in the wet processing category, however it is not fully dry either — therefore ending up in its own semi-dry category. I must also point out that up until this point, I had not really looked closely at the subtle differences between pulped natural and honey methods of processing, however they are distinctly different, given the mucilage is removed in the former, however remains on in the latter (described further below). Although consistency is apparently increased with pulped natural processing, as the risk of too much or too little fermentation is eliminated, thinking goes that this consistency possibly comes at the expense of flavour. Pulped natural coffees commonly tend to have lower levels of acidity in their flavour profile. The remaining seed or green coffee bean is then ready for export. As you can see, this method is the simplest in the form of steps or intervention required, however I am certainly not suggesting it is necessarily easy to do well. Honey processed coffees are a further subgroup of those classed as naturally processed, containing additional sub-groups based on specific criteria. This method originated and became popular in Costa Rica, progressively spreading to other countries in recent years. The term honey is believed to have derived from the stickiness of the mucilage on the outside of the bean, which has a honey-like texture. Believe me – its sticky alright. Here is a short video demonstrating this to some degree, as producer Graciano Cruz of Los Lajones Estate talks about the honey processing method. Black honey — no mucilage removed; 100% of the sticky outer coating remains over the seed; covered to elongate drying time up to 30 days. 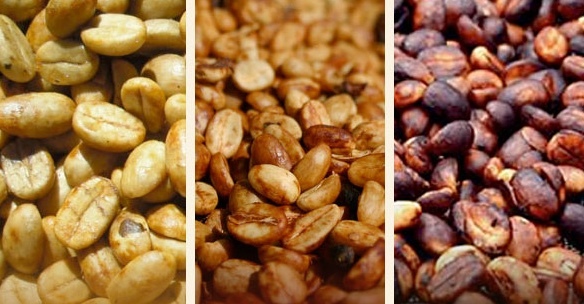 Adapted from Cafe Britt, showing (L to R) yellow, red, and black honey colouration after drying. A point to note on the above list: most articles on honey processing will point to variations that occur from mill to mill or between individual producers. 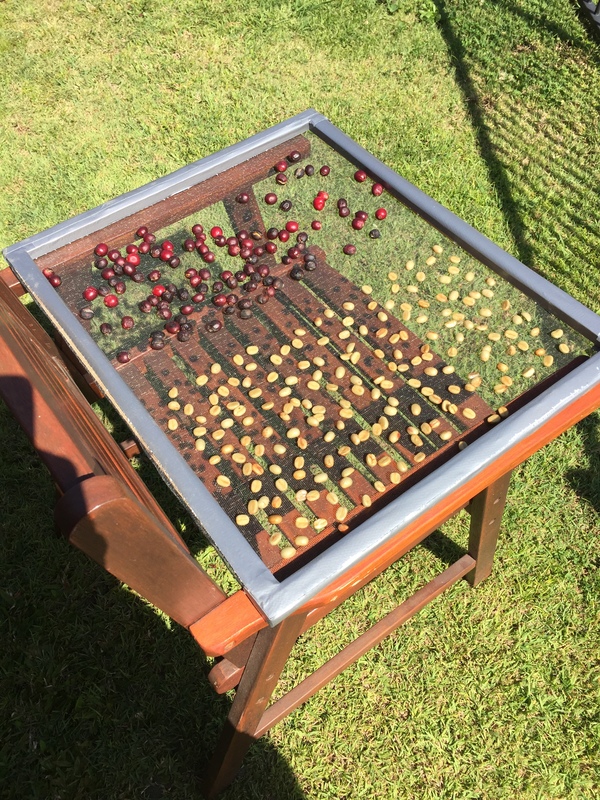 For example, I have seen descriptions indicating black honey processing involves drying the beans covered, with a relatively quick drying time — yet others suggest the drying time is longer. The percentages above are also approximations based on different articles I have read on the subject. Why use dry or semi-dry processing methods? For me personally, the answer is a simple: because I am interested and would like to see how things turn out. On a larger, professional scale, the reasons are obviously very different, and in a competitive marketplace, are a little more involved. Perhaps to oversimplify things a little here, the answer seems to come down to two main aspects: flavour and environment (in which I include both climate, and the producer’s location and built environment — that is, access to technology and logistics around production etc). In general, there seems to be the philosophy whereby natural coffees are a truer reflection of the flavour of the coffee cherry itself. This is not to say washed coffee holds none of these inherent characteristics, however from a consumer’s perspective, it is not often the two can be directly compared. In saying that, more producers seem to be showcasing different processing methods of similar or same harvest lots side by side. …the setup cost is extremely low—you don’t have to have a pulper, concrete, the machinery, electricity to run it — if you’re running a pretty large-sized farm. The labor and how to do it right is really tough. So it definitely is easy to take on; it’s really hard to do well. Natural coffees are perhaps the original method to process coffee. If the first coffee grown as commercial crop, for trading, was in Yemen, the climate is well-suited to dry processing. The western parts of Ethiopia such as Harar are traditional dry-processing areas. Older coffee-growing areas of Brazil as well as newer ones (Cerrado) have distinct seasons ideally suited to dry process method. If a farm can dry coffee from ripe cherry to hard, dried pod in 20 days, it is probably well-suited to DP (dry processing) methods. Compared to washed processing, the natural method is clearly better suited to areas where water might be a scarcer resource, given its considerable utilisation in the various stages of the wet processing method. It then flows on, that drier (read less humid) climates would also be well suited to natural processing, which they appear to be. Clearly in my humble backyard experiment, set up and ongoing costs are not a consideration at any scale, however with the coffee tree in my backyard now over a metre tall, there will be a time in future when processing considerations come into play. Although my time and effort required to process any coffee I produce will be a consideration, I suspect the local climate will perhaps dictate which method might be best overall. Although I have called this series of posts a natural processing experiment – I use that term fairly casually. The plan is to outline in basic terms the methods I’ve used; data collected; recount how things turned out; and perhaps consider what I may do in future. What you won’t see are the usual scientific journal headings under which these components reside, nor a formal write-up with p-values, correlations, effect sizes or the like. In simple terms, what you’ll read about is how I had a crack at it, followed by a tale of what happened. Considering my natural processing options from those listed above, some thought was given to whether the methods used would be readily reproducible; easy enough to accomplish in terms of equipment, technique and time; and amenable to some type of tracking. Finally, it would be nice to utilise more than one type of processing and perhaps compare the two outcomes. Of course there were some limitations in what I planned to do — climate for one. Many articles mention humidity as an “enemy” of natural processing, with Indonesian producers having adapted their methods to account for this, as I’ve described in the wet-hulled processing above. Although I have no real control over this, the drying period occurring in late spring provided some hope of finishing this phase before the full brunt of Brisbane summer humidity arrived. Also, I have no real means of measuring the moisture content of the beans, with devices capable of this more expensive than what I’d be prepared to outlay at the current point in time. It is also beyond the scope of what I wanted to do, however would have provided decent points of reference for both data monitoring and as an indicator of when the process might be done. To that end, based on what I had read to date: “that seems long enough” would have to do. In the end, I decided to try natural processing (entire cherry intact and sun-dried), along with a sample of the honey processing method, most closely aligned with what I have described as “black honey” above (pulp removed, with the entire mucilage remaining on the outside of the bean). In retrospect, the black honey method may not have been the wisest choice in a humid drying environment, however trying to remove some of the mucilage first and to what degree, did not easily satisfy my “ease of use” criteria — whereas removing the pulp and simply leaving them did. So things were now underway. A small lot of coffee cherries halved into even smaller batches, one natural and the other honey processed. Hopefully I have done a reasonable job above in explaining the basic differences between methods to provide you with some understanding of each — no doubt many of you will already be fairly familiar, however I though it would be a good starting off point. Future post(s) will report back on progress and ultimately the outcome of my own little experimentation into natural processing methods — hopefully you’ll check back in and see how things went. Fascinating stuff, Peter! I’ll be following this process, and reading your older posts to catch up. Thanks Michael – I hope it’s of interest! Hi Pete, I have experienced lately with the red honey process in my coffee farm and It has been interesting to find the sweet fragance of the parchment (with mugilage) in the coffee cup (aroma). Have you enjoyed Vietnamese Coffee yet?